WKU’s Textbooks For Troops program is having a positive impact on enrollment and on the University’s growing national reputation as a “military friendly” institution. In the spring 2016 semester, 2,339 military veterans, active duty, reservists, National Guard and military family members attended WKU. That’s more than any other four-year public university in Kentucky, according to Tonya Archey, director of Military Student Services. “Our Textbooks For Troops program is really making an impact on enrollment and retention,” she said. 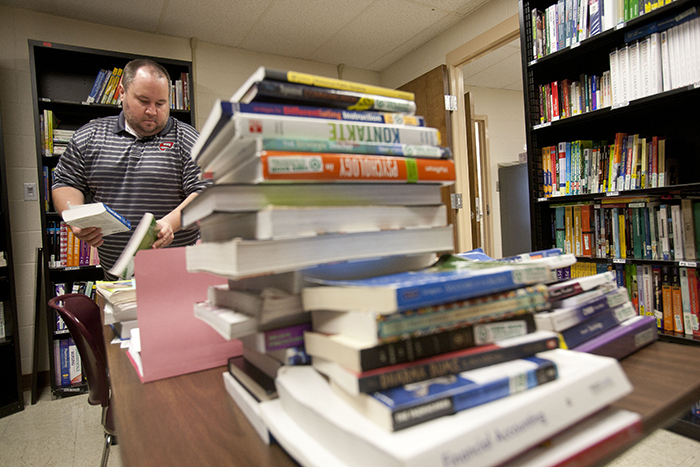 The lending library – funded through private monetary donations and through books donated by the WKU community – contains about $300,000 worth of books and has assisted more than 1,400 students with free books since 2011, Archey said. The program is the largest scholarship program of its type in the nation and provides books/resources to eligible military, veterans and their family members enrolled at all WKU locations and to military students taking WKU distance learning courses around the globe. Before the fall 2016 semester began, Archey received a call about the program from a member of the U.S. Navy in San Diego and heard from a member of the Air Force serving in Afghanistan who had received a book through Textbooks For Troops as she prepared for her first WKU class. Military enrollment at WKU has increased steadily 13 percent to 19 percent each year. “We expect that trend to continue as long as we continue providing exceptional service to this population,” Archey said. WKU Military Student Services began in 2011 with the mission to provide personalized support for all military, veterans and dependents. The support and programs have been recognized by several publications. WKU was ranked as the nation’s No. 7 “Best Online College for Veterans” and No. 10 “Best College for Veterans” for 2016 by BestColleges.com. WKU has been ranked as a “Best for Vets 4-year College” by Military Times Edge magazine for six consecutive years and was ranked as high as No. 7 in 2014. WKU has been designated as a “Military Friendly School” every year since 2009 by Victory Media and was named a “Top 100 Military Friendly School” for 2016 by Victory Media. WKU has been named one of the “Best Colleges for Veterans of Regional Universities in the South” by U.S. News and World Report and one of the “25 Great Colleges for Veterans” by MONEY. The 2017 rankings will be announced later this fall. WKU Military Student Services provides other services, including support and guidance with GoArmyEd and tuition assistance requests for all branches of the military; and a Veteran Resource Center, a dedicated space for military, veterans and dependents located at Tate Page Hall 410 on the Bowling Green campus. The Student Veterans Alliance, a coalition of student veterans helping each other succeed, uses the space for monthly meetings, as well. A Military Student Services center opened in 2015 at the WKU Glasgow campus. WKU also offers unique services to our military students that are not available at any other university in Kentucky: a discounted tuition rate of $250 per credit hour to all active duty, reserve and National Guard members; and the only therapy dog, CanDoo. WKU has the only Veterans Upward Bound program in the state, an award-winning Army ROTC program, an Air Force ROTC program, and its Office of Veterans Affairs serves more than 800 students utilizing the GI Bill. WKU is also a Yellow Ribbon and MyCAA participating university. WKU proudly serves the Elizabethtown-Fort Knox community by providing classes and student support services on post and at the Elizabethtown regional campus. For information about the programs offered at WKU, visit www.wku.edu/military or www.wku.edu/veterans. Elaine Weiss, author of "The Woman’s Hour: The Great Fight to Win the Vote," will visit WKU April 29-30 to kick off a yearlong celebration of the 100th anniversary of the 19th Amendment. Susan Ingram Howarth has been appointed Executive Vice President for Strategy, Operations and Finance at WKU. She will begin her duties at WKU on June 17.